Tune in to this the most recent episode of our Future.Bible Podcast with our special guest, Greg Outlaw. Greg is the co-founder of AllAboutGod.com. AAG writes compelling websites that reach out to skeptics, seekers, believers, and a hurting world with powerful evidence for God and the Good News of Jesus. It is the most cost-effective online evangelistic outreach in the world. Get to know more about Greg and his work through their website at AllAboutGod.com. DJ Chuang: Welcome to the podcast today. This is the place where we get to interview, connect with leaders, innovators, and entrepreneurs that took in a section of the Bible and technology. See what’s happening right now in that phase because of time zones, we span, I think half the globe and it’s great to connect with all kinds of people on. 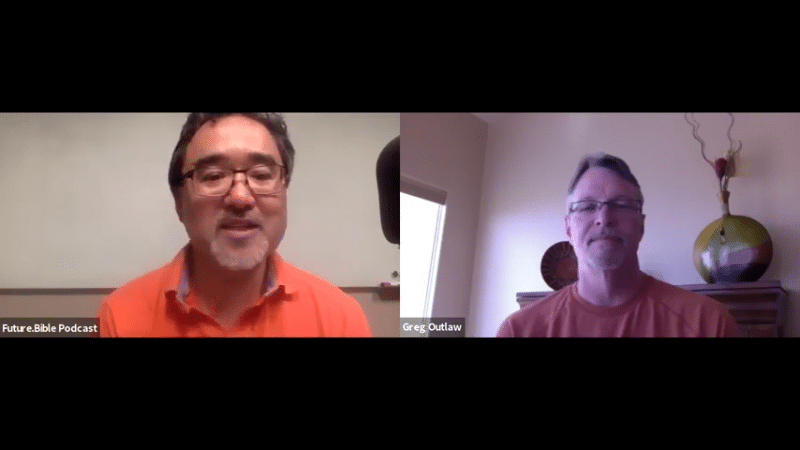 Today, we’re connecting with Greg Outlaw, president and CEO of All About God. How are you doing today, Greg? Greg Outlaw: I’m doing well. Thanks DJ. DJ Chuang: Awesome. Awesome. Thank you for making some time to chat with us. Let me introduce you to our audience and you’ll see just what amazing things God’s done through him. So, Greg Outlaw, founded AllAboutGod.com in 2002 which is pre-iPhone, for those of you keeping record, and it has become the most cost-effective online evangelistic outreach in the world. And historically at least one person has indicated a decision for Christ and the Gospel has been presented over a hundred times for every $1 they spent. Greg has been a practitioner SEO expert since 1995 and has spoken at National Religious Broadcasters Conference, which is coming right up here in Anaheim on March 29th Christian Leadership Alliance Conference in Dallas, which is in April this year, Internet Evangelism Coalition and Liberty University. I’m sure many other places and Greg has consulted for compassion.com, focusonthefamily.com, biblica.com, gotquestions.org and many, many others. So anything else you want to add to that? Greg Outlaw: Nope, I think that’s plenty. DJ Chuang: Okay. Well I’m sure we have a lot to talk about since you have 17 years of experience. But, we also also have limited time. So, we’re going to get right to what our audience wants to know. So, how did you start allaboutgod.com and how has it been able to reach so many people? Greg Outlaw: We started it actually from a failed.com because of the .com bubble and me coming back to faith in Christ and really getting on fire for Him. And then I discovered that basically SEO was the reason I was so talented. That it was part of my calling and purpose that God had for me. And so that’s kind of how it started in 2002 at Saddleback Church Reports Church. DJ Chuang: Oh, that’s where I am. Yeah. I’m literally in the office of Saddleback church as we’re talking. Greg Outlaw: Oh, that’s cool. DJ Chuang: That’s pretty cool. We’ll have to talk some more after this. DJ Chuang: So, as you’ve learned about search engine optimization, you started this website. What kind of content did you put on there and how did it connect with people and so much audience? Greg Outlaw: Well, we have all kinds of content. So, we have 20,000 pages in 14 different languages spread across 53 websites. And we basically look and do research for what people search for. And then we write articles, one page executive summaries or create short videos around that content. And then, we worked to rank them organically in Google and the other search engines like Baidu and Yandex and things like that. DJ Chuang: That’s amazing. And you’re getting how much traffic now, like these days? Greg Outlaw: Between 3-4 million visits per month and lots of Gospel presentations, of course from that and then decisions for Christ. So, on an average day, I would say about a hundred thousand Gospel presentations and about a thousand people make a first time decision for Christ. You know, I don’t really know if they’re saved. They’re only indicating the decision. Only God knows, but that’s what they’re saying. So that’s 1% of all the visits per day. DJ Chuang: That is some amazing impact in it. Amazing statistics. What kind of a followup process do you have after they indicate it, the decision for Christ? Greg Outlaw: We try to connect with them first. We’ll try to answer whatever question they had. So, we ask a whole question or prayer request. We have disciplers that engage with them directly online and then, we lead them to content to try to get them into the Word specifically. Also lead them to a local fellowship, whether it’s a house church or a regular traditional church like we have in the United States. Or if it’s a closed country, we try to provide a week and then actually decide that they are truly looking and seeking and just made a decision for Christ. We’ll connect them with some people we trust in closed countries. So that’s basically what we do to follow up. DJ Chuang: Well that sounds like a lot of work. I mean, how many people do you have working on this? Greg Outlaw: So, we have about 40 people that volunteer in different capacities from that and about 10 people on staff. DJ Chuang: Wow. That’s a huge team. And I’m guessing they speak some of those different languages. Greg Outlaw: Yes. Some of them do it. DJ Chuang: And, now as we’ve seen the evolution and growth of the Internet technologies, since 2002, we have smartphones now. We have iPads, we have smartphones that have super fast speed that can stream. How has that affected your ministry? Greg Outlaw: Only better and better. The more people that get on, especially with mobile devices… Actually, because we’re focused around building around a mobile experience and because the sort of the secret sauce for Google lately is speed — How quickly your page loads. And that’s not just locally, that’s globally. And since we’re focused on a global outreach, really trying to make it happen very quickly for people and using multiple layered CDNs across the world, enables us to do that cost effectively. DJ Chuang: Okay. Audience is probably technical enough to know what CDN are, but for those that are not as technical, CDN stands for what? Greg Outlaw: Content Delivery Network. So, whether there is the closest server to the, wherever that person is locally, they have a cached copy of that particular page so people can get it fast. DJ Chuang: Excellent. Very good. And wow. So you’re connecting with so many people a month with relevant content. And what would be an a couple of examples of keywords or phrases that allaboutgod.com ranks really high and connects with people? Greg Outlaw: Okay. So, if it’s specifically allaboutgod.com, people typed in like “where is God”, we come up number one on Google. And I’ll type in “what is sin”, we come up number one for that. If it’s other websites like, allaboutJesuschrist.org, they might have been “who is Jesus” or “who was Jesus” and come up number one for that. “Origin of Islam” for allaboutreligion.org. There’s several. DJ Chuang: Well I’m sure there’s a lot more you could say, but I know when it comes to being an SEO professional, some of that may be kept it a little bit more quiet and you might offer services for that. But would you be able to share a couple of tips of how a ministry or a church can be better ranking on search results. Greg Outlaw: Sure. Well, the biggest thing is writing good content and that content most importantly is referenced. So, you can’t just write just anything and expect to rank on a permanent basis well in organic search. And even if you do write it well, Google’s rankings fluctuate, as you know. So, you want to make sure you’re doing everything you can. So, referenced material is really important. So, using people that uses references and a reference can be just a Bible reference. If you’re referring to, you know, the Bible and you put it in a footnote below it rather than putting in the article itself, that makes a big difference. Speed, how quickly your templates load. We’ve gotten to the place in the United States. We’re used to really fast speeds and we’ll make our website templates one or two megabytes for the initial download. And that’s really it. It’s just too much data to download in a rapid fashion. So, it is like a 10th of that is really where we try to target and that’s what I would encourage is the main leverage point right now beyond links and the content idea that I just shared. Those would be the main ones. DJ Chuang: Okay. Thanks for those tips. And what allows you to keep your cost of outreach? Greg Outlaw: Well, we don’t pay anyone for positions. I’m not on staff. As a CEO with a title, I’m just getting paid as the CEO, I get paid for deliverables just like everyone else does. So the work I do, I’m paid through my company you for doing it. So that’s one way. The other way is we don’t use other methods of a traffic aggregation or trying to build an audience other than SEO. And we do that specifically to keep our costs low. Since SEO is our expertise in-house that basically costs us nothing but our time and effort to do that. And, we’re doing that anyway. So that’s kind of a key thing that we focused on. DJ Chuang: So I guess over all these years, 17 years and counting is that people are searching, still searching and that is not going to change. Is that what you’re sensing? Greg Outlaw: That’s what I’m sensing. And that’s what the data shows that 93% of the people still online still engage with a search engine specifically Google being the most popular obviously but, that they still do that. So, that poll method of a kind of a hot lead as opposed to just doing social media where you might be doing cold leads or other things where they’re pulling the information when they want it rather than you’re trying to push and vie for their attention, we found to be most effective for evangelism. It’s not most effective for all things like building an audience or discipleship or building a community. But, It has been extremely cost effective for evangelism specifically. DJ Chuang: That’s pretty neat. Now, just to clarify, a lot of times when organizations, ministries, churches are trying to get more visibility into Google, they will buy ads or they will use something like Google grants. So, what kind of a budget are you spending to get your content in front of people? Greg Outlaw: So, we spend zero, we don’t spend any budget for marketing. It is just basically whatever it costs us to create the content, publish it and maintain it. That’s what our expenses. DJ Chuang: Amazing. And that’s called organic search. Greg Outlaw: Yes. Organic search. DJ Chuang: And then, how about Google grants? A lot of nonprofit try to use that. Greg Outlaw: Yes and we don’t, simply because it just requires a lot of effort to maintain a Google grant, whether it’s 10,000 a month or 40,000 a month, and the small amount of traffic that we get compared to organic search, we just have not found it to be worth it in resources to do it that way. Now, I’m not saying that’s true for all organizations. Smaller organizations, I think it makes perfect sense to do that, but for us, it just doesn’t make time to have a person that’s solely dealing in that arena. DJ Chuang: Okay. Good to know. Good to know. Well, as we wrap up, you’ll be at the National Religious Broadcasters Conference 2019, and there’s a digital media summit on Friday, March 29th, and you’re one of the presenters. So, what will you be talking about? Greg Outlaw: I’m going to be talking about a shift in All About God. So, all about God is pivoting — according to our last board meeting — from just seeking and saving the lost to also, trying to serve the body of Christ. So, we’re going to be giving away our proprietary SEO CMS. That’s a content management system. We’re giving that away for free to any ministry along with free hosting for any ministry that will embed the Gospel on the pages of their website. They can have it for free. And, as they produce more content, we’ll spend more time helping them write better for free as well. DJ Chuang: Wow. What an offer and I’m excited to hear more about that and maybe connect you with some other partners through our relationships and really see that flourish. So, thank you. Thank you for being with us here on future.bible. Is there any other website or company you want to mention before we wrap this up? Greg Outlaw: No, I don’t think so. I think just allaboutgod.com is where everybody can find all of our other websites. So, there’s links to that under all topics that, that’d be great. DJ Chuang: Great. And then how can people connect with you personally, maybe on social media? Greg Outlaw: Yeah, so my best way is linkedin or Twitter. I have the others, but I spend a lot more time on linkedin. So, it’s this linkedin.com/in/gregoutlaw or you can go Twitter at @gregoutlaw. Either one. DJ Chuang: Super. Well, thank you so much Greg. And this wraps up our episode of future.bible. The show notes will be @future.bible and you can easily click on all those things, links we just mentioned. Please, let us know your thoughts and reflections about today’s conversation at future.bible and we are looking always looking for suggestions regarding future shows and we ask for your input because we want to be the number one show where you get to meet innovators, ready to talk and talk about how we can apply the always evolving world of technology to be never changing message found in the Bible offering real life change. So, until next time, be blessed and remember to be a blessing. On an average day, I would say about a hundred thousand Gospel presentations and about a thousand people make a first time decision for Christ. You know, I don’t really know if they’re saved. They’re only indicating the decision. Only God knows, but that’s what they’re saying. The biggest thing is writing good content and that content most importantly is referenced. So, you can’t just write just anything and expect to rank on a permanent basis well in organic search. Referenced material is really important. So, using people that uses references and a reference can be just a Bible reference. If you’re referring to, you know, the Bible and you put it in a footnote below it rather than putting in the article itself, that makes a big difference. I guess over all these years, 17 years and counting is that people are searching, still searching and that is not going to change. 93% of the people still online still engage with a search engine specifically Google being the most popular obviously but, that they still do that. We spend zero, we don’t spend any budget for marketing. It is just basically whatever it costs us to create the content, publish it and maintain it. That’s what our expenses.